Madison, its nice to watch one of your mindwheels in motion. As I walk with you and others, I wonder, what is Madison observing about the natural environment. From my window at Ban Radtinaya I can see the giant trees along the boulevard, like elephant legs, absorbing our carbon monoxide and generating oxygen. (Imagine their root systems under all this concrete.) For how long? 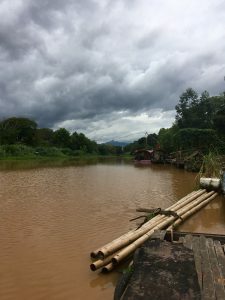 And the MaePing river lacing through Chiang Mai — I appreciate how you subtly helped to educate our simple thoughts – brown and muddy equals polluted and bad. There are natural reasons such a rapid rainflow, but that river is polluted. I watch the men fishing with nets and they’re catching them, but wow. This area would be a fascinating study of its own. It occurred to me as I read your post, while Thailand is under military rule, wouldn’t it be an excellent time to implement efficient waste and sanitation systems as there is little to lose, but I bet they are working on more pressing issues. Excellent post. Thanks Madison.